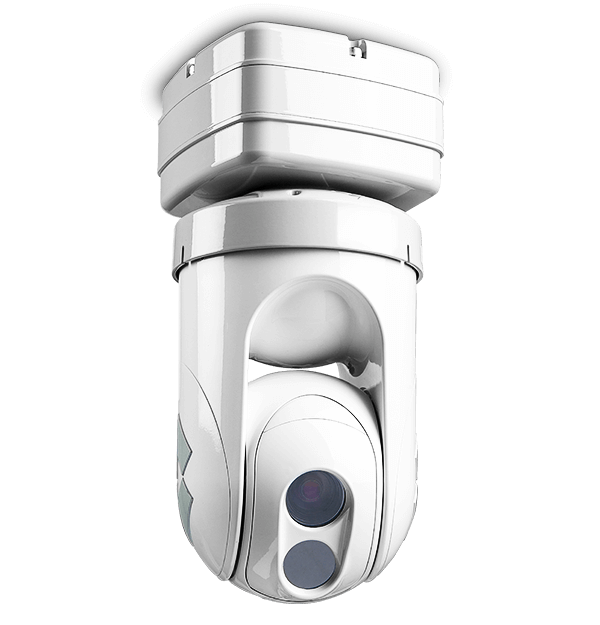 The dual thermal and visible pan/tilt dome camera. The Triton D-Series features 640 × 480 thermal resolution and can be fitted with a broad range of thermal lenses with focal lengths from 9 mm to 35 mm, creating FOVs from 48° to 13°. The rugged outdoor dome enclosure provides 360° continuous pan and +45°; to -180°; tilt. Open IP standards also enable easy connectivity. A complimentary color CCD video camera with 36x zoom provides simultaneous visible light imaging in a wide variety of environmental conditions. Two independent channels of streaming MPEG-4, H.264, or M-JPEG for each of two cameras; multiple streams per channel.